Auto dealerships face the challenge of making keys readily available to the sales force while safeguarding them from potential thieves. 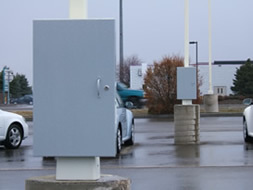 Our commercial quality steel lock boxes provide a sturdy, weather tight and secure storage point that can be placed strategically throughout the lot. 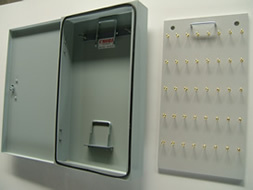 The key lock boxes are fitted with high quality barrel locks. 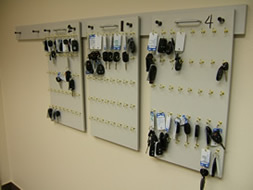 The keys are hung on a portable keyboard with forty key hooks. 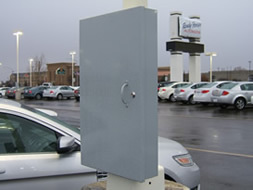 A handle mounted to the keyboard makes for easier transporting from the lock boxes to a secure location inside the building for closing hours. Reinforced housing at U-bolt attachment point. 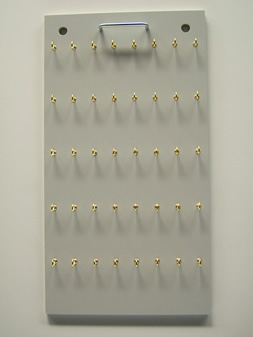 Optional mounting strips with studs are available for interior storage. 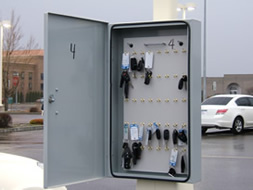 Extra additional lock box keys are available in any quantity. Installation is available only in a limited area. Please call for details and quote.